No single tool can provide best solution for each step of engineering analysis of high speed system from beginning to end. Usually different vendors provide best point solution in their own specialty areas. That’s why most companies will have more than one tools and scripts is used to bridge the gaps or to “stitch” them together and form an unique flow for the organization. However, half baked software practice usually incurs long term maintenance problem or even damage organization’s reputation. Precious engineering resources are often wasted in areas not directly related to either business charter or personal career development goal. Example of these is asking SI/PI engineers to write scripts or CAD developers to write half-bake solutions. That’s why we SPISim can provide valuable service to your organization in the flows and methodologies. We are engineers with both great in house expertise in EDA development and experienced in signal, power integrity and analysis. We know the state of the art approaches in this field and can make your flows and methodologies profound. They will be realized in customized software solution to incorporate your existing toolset and achieve best results. We have both pre-layout and post-layout capabilities in pre-silicon/tape-out and lab areas as well. 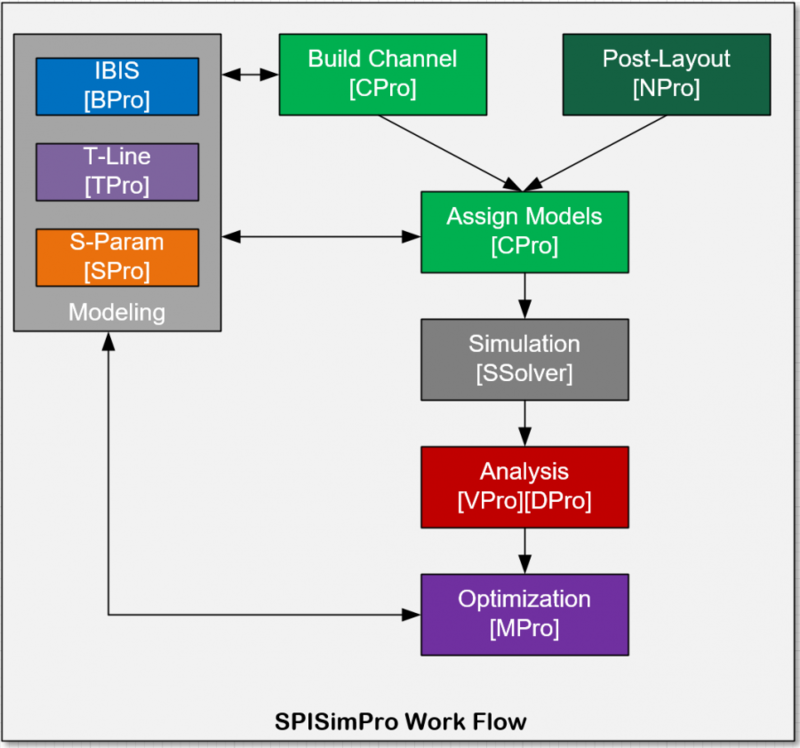 In pre-layout flow, we have modules from schematic editor, spice netlist generation, multi-thread based or simulation farm based simulation launcher, waveform post-processing and reporting in csv, excel format or charting in different styles. 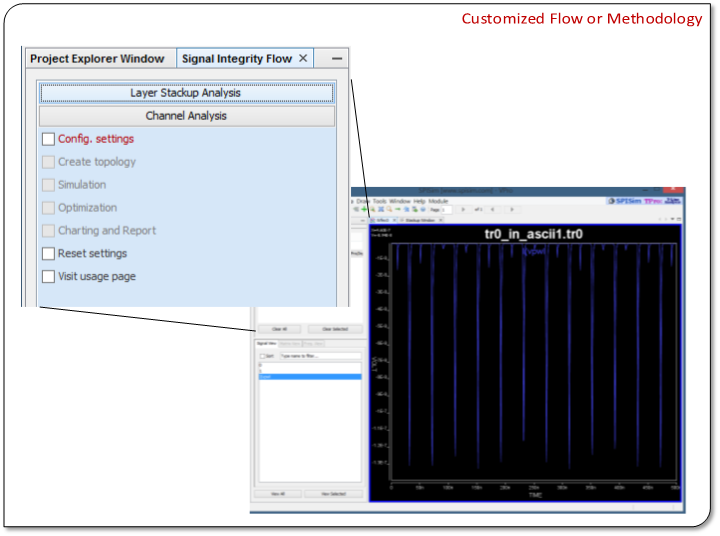 In post-layout flow, we have modules from layout database retrieval (.MCM/.BRD/.SPD/.OBD++) for net based analysis to artificial layout synthesize for prototyping or design optimization. Combined with our modeling modules and simulator offering, they can be designed, processed and optimized in streamlined flow. Beyond our canned modules, we can customize just for you. For best presentation quality, play HD version with full-screen mode.